This is the latest in a periodic series of one-on-one interviews with William McDonough(@billmcdonough), renowned designer, architect,author and entrepreneur, looking into his rich, kaleidoscopic professional world. McDonough has been at the forefront of many of sustainability’s most important trends: green buildings, closed-loop systems and Cradle to Cradle design, among others. This installment focuses on the recent World Economic Forum conference in Davos. You can read the first two installments here and here. Joel Makower: Let’s start with a little backstory about your participation in Davos this year. William McDonough: This was my ninth time at Davos. I was there previously as a part of the World Economic Forum’s efforts to enrich the mix of people with diverse perspectives. I was there to participate regarding design, architecture, environment, sustainability, new business models — those kinds of things, and to be available as a resource. This year, Davos took on climate change but also started to dig into business sustainability as a primary issue. The World Economic Forum has joined with the United Nations to reframe the urgency of dealing with climate change, and back in August I was able to participate in some of the organizing meetings in Geneva. The World Economic Forum is starting to work on dealing with climate change from a critical economic perspective. And so in Davos, there was one whole day featuring dedicated discussions on climate change. This is really quite amazing when you think about it. As an additional centerpiece of that day, I was asked to create and lead an interactive workshop to engage business, NGO and government leaders in the fundamental issues of designing for intergenerational beneficial growth. The next day there was also a workshop on the circular economy, of which Cradle to Cradle and The Upcycle are obviously most enthusiastically supportive protocols. Makower: Let’s take those one at a time. Tell me about the workshop you did. McDonough: I called it “Beyond Sustainability — From Limits … to Growth.” In the title, as you’re well familiar, I’m having fun. Makower: Right, because of Donella and Dennis Meadows’ 40-year-old book, The Limits to Growth. McDonough: Right. And for most business people, when you talk about sustainability in business, they think it’s an added cost, and it doesn’t have the returns of normal business. To many of them it usually means you add costs and lose money trying to be well intentioned. The economist Kenneth Boulding had an amazing line. He said, “Anyone who believes exponential growth can go on forever in a finite world is either a madman or an economist.” So, for the World Economic Forum, I thought, “We’re not here just to talk about maintenance. We’re going to move beyond thinking of limits and zero goals.” This idea of limits, which has framed the dialogue, has got everybody into this legitimately shrill and worrisome notion that we’re running out of everything. What we’re now adding to the conversation is how the fundamental question of commerce can move from just fear of limits to also include a celebration of abundance if we’re growing the things that make the world better. I heard this the other day from a major environmental NGO head, who said, “The argument we use is that nature doesn’t need humans — humans need nature. Nature provides all these services and benefits and utilities. And we need to preserve nature because we need it. It doesn’t need us. It’ll be here long after we’re gone.” That’s interesting, except for one thing. At this point in history, nature does need us. It’s our turn now. We can help restore it. Because we are the dominant species, and everything is in decline. Makower: So, the circular economy is how we do that? McDonough: The concept of the circular economy can certainly inspire us and point the way, but we have to remember it’s still circular. It’s two-dimensional. It’s flat. It’s just the economy in a circle. What I am really excited about is how we will build on our circular economies and also encourage moving toward the next level — the spiral economy. It’s something that’s growing. You can’t grow without income, and the only thing the planet has as income is solar energy. It doesn’t have material income — it’s not raining phosphate. So the idea that we put these things in circles and cycles with new design, science with effective business models and then grow safe and healthy things and systems we can all share is fabulous. We can start to talk about growth again, and that’s where humans become tools of nature. Right now, nature is a tool for humans. Makower: Was that the basis of your Davos workshop? McDonough: Yes. In the session, we had 90 global leaders at nine subject tables led by sustainability and business superstars — Morten Albaek of Vestas, on energy; Doug Baker of Ecolab, on water; Ton Büchner of AkzoNobel, on the built environment; Steve Howard of IKEA, on energy; Hannah Jones of Nike, on materials; Mindy Lubber of Ceres, on finance and communications; Jeremy Oppenheim, formerly of McKinsey, on the circular economy; Saundra Pelletier of WomanCare Global, on fair society; and Jeff Seabright of Coca-Cola, on the circular economy. I gave an opening talk on cradle to cradle and the upcycle concept, of how the world gets better. Then we had a working exercise. We all had Post-It notes, and used the Upcycle chart as a tablecloth. 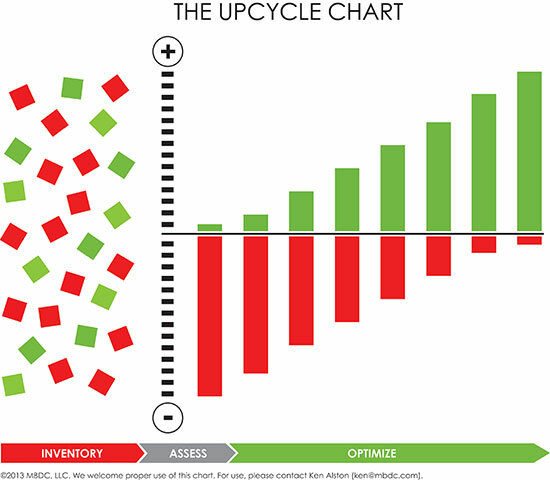 The goal was to reduce your bad, in the red, and increase your good, in the green. What I said was, “We’re going to do both.” I am often misinterpreted when I say, “It’s not good enough to be less bad.” People are thinking I am saying don’t do it. Of course we encourage everyone to be less bad. It’s just insufficient. So, we talked about what it means to be more good. That was the primary message: Just be more good and less bad, not just be less bad and think you’re being good. We had so much fun, Joel. People would write down, “I’m reducing my carbon emissions by 20 percent by 2020,” and they were trying to put it in the “more good” zone because they thought they were doing something that was good. But the other CEOs said, “No, no. It’s good to reduce your carbon emissions. Please do that, but we can’t call it ‘more good.’ It’s ‘less bad.’” It was so beautiful. And then we went around the room and the tables reported out what they discovered. Makower: Were you surprised about anything that they reported out? Makower: That sounds like fun. Is there any follow-up with these CEOs? Makower: What kind of response did you get? McDonough: I’ll give you a couple of examples. Ton Büchner, the CEO of Akzo Nobel, wrote: “Our table had a special thought regarding ‘better living spaces.’ Contrary to the general urbanization thinker, who talks about infrastructure, energy, transport and other important physical aspects of life, we spoke about the well-being and experiencing of life in the place where one resides. We talked about the fact that we have displaced nature as a habit in the past. That we have built structures to keep nature out. We discussed that whereas urbanization is a fact of life and generates wealth, this nature fighting and replacement philosophy needs to reverse. We need to bring nature into the city as an integrated aspect, especially when 70 percent of the population will live in cities in the future.” Saundra Pelletier, CEO of WomanCare Global, responded: “We all realized that regardless of the issue — water, energy, population growth — that creating an opportunity for women and girls to control their own destinies by controlling the number, timing and spacing of their children, was a powerful fulcrum for change. It’s about dignity, really. By the time the conference ended, the enthusiasm for improving the lives of women and girls was palpable. It was a great forum for us to showcase our work and garner support from some of the brightest, most influential people in the world.” Al Gore closed my session for the WEF. He was the rapporteur who listened to the tables’ leaders reporting out. And then he closed it up. It was very kind of him because he’d just come from the main stage at Davos. Makower: Sounds like a great response. Now, let’s talk about the second event. McDonough: The next day was a session on the circular economy, with Ellen MacArthur from the Ellen MacArthur Foundation in London. It was the announcement of what they’re calling Project MainStream, about the circular economy and how to make it mainstream. The implication of the circular economy is trillions of dollars’ worth of business that can put materials and systems into a regenerative state. The question was how do we make this mainstream. It was the same room in which I had done my workshop the day before, and we had many senior business leaders taking an active part. Makower: What was the format? McDonough: There was a panel on the stage, and it was Dominic Barton from McKinsey, Sir Ian Cheshire from Kingfisher, Ellen McArthur and others. I helped by facilitating a table on design. We had all these tables in discussion for half an hour, and then we reported out from the tables. Makower: What did you learn? McDonough: The whole idea of products as services we were writing about so many years ago is finally coming of age. For example, Frans van Houten, the president and CEO of Philips, was talking about selling light as a service — you know, selling lumens rather than selling lamps. Really cool. Philips is just going to sell light. Makower: I’m guessing you’ve come away from all this pretty optimistic. McDonough: Absolutely, but it’s my nature. I’m a designer. We wake up in the morning helping the world get better. That’s our job. So I’m always optimistic. I felt humbled by Davos, though, because here we are — 1,000 CEOs and probably 400 or something heads of state, ministers and people like that. And yet we’re only 100 people in this tent this year. So that was humbling. Makower: We’ve both been to countless talkfests. Some of them high-level, some less so. And people often come away from them saying, “That was interesting. I’ll believe it when I see it.” Or, “We need less talk and more doing.” What do you think will be the touchstone, where you’ll know that this wasn’t just talk? McDonough: I think because it’s the World Economic Forum, everybody is trying to do the right thing, but finding ways to do it in business that makes people money. That was what was exciting: There were people reporting on the business success. You and I have talked about this before. The power we have had in our cradle to cradle and upcycle work is that we work in business. When Ford saves $35 million in capex. When costs to make a textile are reduced by 20 percent. When profits of a company go up 6 percent because of people taking on these agendas. When companies can recruit the better people to work there because they believe in the mission of the company. All these things are business matters, and they matter to business. So that’s the key to this thing — that we can show tangible business results. The difference is that we read our spreadsheets differently from other people because we’re looking for values, not just metrics. Upcycle graphic via MBDC, LLC.